The Deputy Foreign Minister for Political Affairs, Dr. Mansour Bajash, met on Sunday with the Russian Ambassador to the country Vladimir Didushkin. 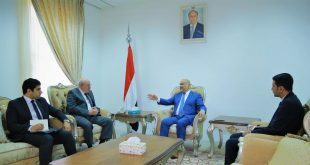 During the meeting, they discussed the bilateral relations between the two friendly countries and the developments in Yemen, and discussed developments related to the formation of the coup government in Sana’a and the map of the UN envoy to Yemen Ismail Ould Cheikh. The agent valued Jash’s support for the constitutional legitimacy of the Russian Federation and its condemnation of the formation of the coup government in Sanaa and considered it a unilateral step that hinders the political settlement in the country. 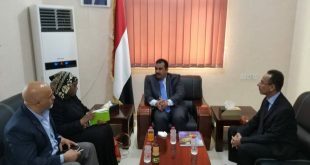 The meeting also touched upon the remarks of the legitimate government on the map of Ould Cheikh, which was handed over to the UN envoy during a meeting with President Abdurbo Mansour Hadi, President of the Republic, during his meeting in the interim capital of Aden. 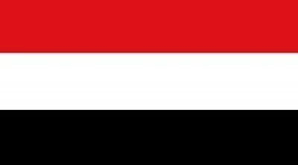 For his part, the Russian ambassador stressed his country’s position in support of constitutional legitimacy and peaceful solution in Yemen, pointing to the importance of reaching a peaceful solution to end the war and alleviate the suffering of the Yemeni people. The meeting was attended by the official in the office of Foreign Minister Ahmed Sharabi.